Exhibition Label: Portrait mask. Wood, hair, abalone shell, cotton, iron, paint. Haida. 19th century. Haida portrait masks represent actual people and were probably used in performances in which the person was “killed” and miraculously revived. 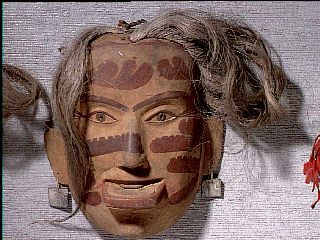 The facial designs on this mask represent cumulous clouds and signify a spiritual link to natural forces. This mask also includes ear and lip ornaments.